There’s a place I go in Chardon to let loose the bonds of self-control, a place where I’m uninhibited. It isn’t far from home. In fact it’s right on the Square. Likely you’ve walked past it, perhaps even through it without realizing the liberties it offers. It doesn’t serve wine although that would be lovely. An affectionate domesticated pet could lend something to the ambience. Full-length pencils would be good. Nonetheless. In this place I’m free to satisfy my whims, aimlessly seek entertainment, take up leisure, engage or withdraw, lose track of time, lose focus, change direction, act on impulses, mindlessly consume. Within its walls I’m easy-going, flexible, light-hearted, affable, spontaneous even. I may indulge my inner child, find myself, lose myself, diagnose myself, find God, a recipe for beef bourguignon, passage on a vessel to an uncharted land, learn to fold origami, draw anime, keep bees, arrange furniture, write a fiction novel in 30 days, experience the world through the life of an Amish baker, an Irish immigrant, a teenage girl in love with a vampire, a man in the belly of a whale, a jail matron in the 1920’s, a veterinarian in rural England, a wife of Ernest Hemingway, a cat in a hat. I can visit any day of the week, come as I am, go as I please, and take all I want without paying a dime. I’m a patron of the Chardon Library, endowed with all its rights and privileges in perpetuity. Are you? There are mystical forces at work within the library; those with the power to transform frailty into strength. I stand among its stacks the way I stand in line at King Kone – eyes wide, calculating the most favorable combination of ingredients – I’ll have a brownie delight sundae with chocolate peanut butter ice cream drowned in butterscotch and fudge. Nuts? Sure. Whipped cream? Why not. But hold the cherry, let’s be reasonable. The library is an all-you-can-eat menu and I can always eat. I overindulge without gaining an ounce though I do gain respect. The only reputation I’ll earn for binge reading is that of being well-read. At any one time I can borrow 75 items, plenty for an artfully arranged stack. Being temporary residents of my home they’re weightless. I return them guilt-free, sometimes before I’ve even read them. Of course there are always more books to be read. The librarians are enablers, pushing their BookPage magazines, making recommendations. Pretty soon you’re huddled outside the doors at 8:45am in subzero weather. The library was made for cheapskates like me. The books are free, the programs are free, and it’s damn near impossible to incur a fine. I take out loan after loan after loan and never pay it back. I can max out my library card, use until it splits in two then get a new one. If I need to be heard I attend bookclub where it doesn’t matter if I loved the book, hated it or never cracked the cover. I still get my say, get my free cookies, too. When I need to feel superior there’s a book for that. There’s always a character who’s got it worse than me, or better, for when I need inspiration. 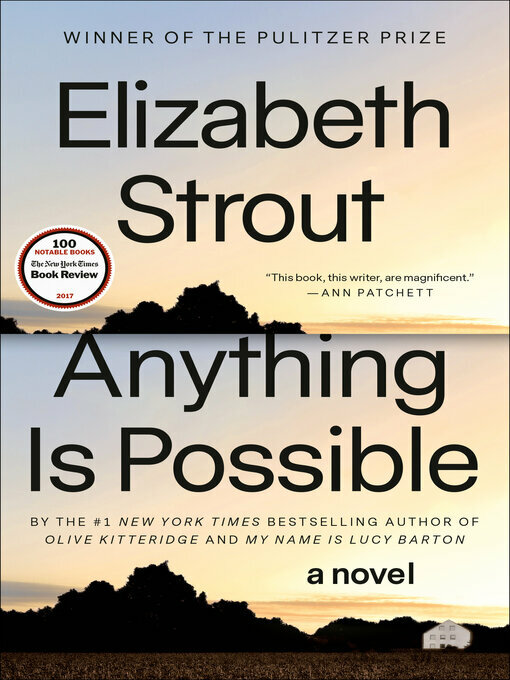 Shannon is currently reading Anything is Possible by Elizabeth Strout, which is the next title in the Chardon Branch’s Book Discussion.